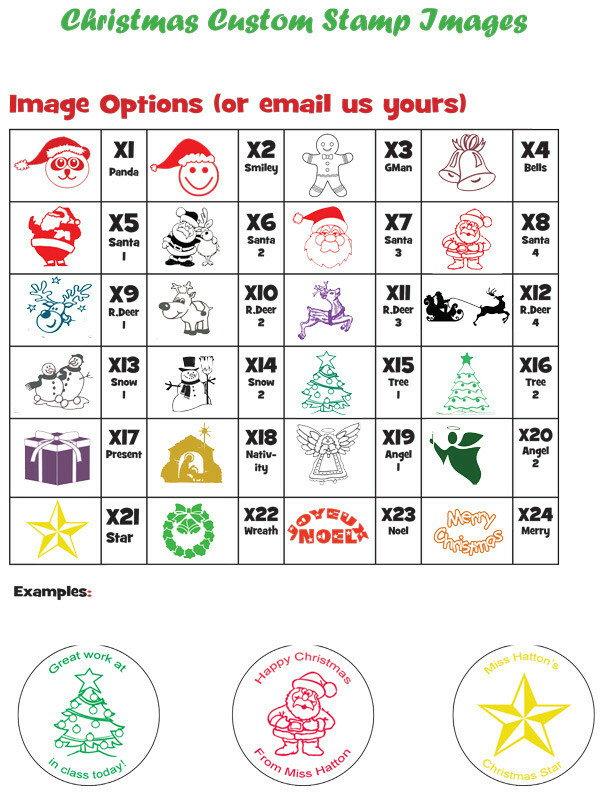 Add some seasonal fun to your marking and reward messages with a Christmas design personalised stamp with your unique custom message to delight your students. With this customisable stamper option you can choose your image, ink colour and wording - so 'everything'! For your central image, choose from the stock design sheet shown or contact us for help if you can't see an appropriate design. Alternatively you can send us your school logo or design. The stamper ink will last for thousands of impressions but can be refilled. See our article on how to maximise the life of your stamper - Stamper usage and guidelines. 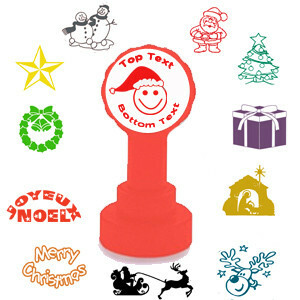 The stamp's full image, (central design and wording) is max 20 x 20mm. Other sizes are available, contact us for options. 1000s impressions before re-inking required. Ink available separately. Allow 5 - 8 working days for delivery. If your order is urgent, please contact us for current production times. Choose your design - from the image design sheet shown (click the thumbnail under product picture left). Select your chosen design in the drop down menu below or select to use your own image/logo. Note: own designs/school logos need to be high resolution files. Send to sales@classroomcapers.co.uk. Choose your ink colour using the drop down menu below. Enter your text - in the spaces provided below (text top and/or bottom is optional). Please note the maximum number of characters (including spaces) is 18 for the top and 18 below the image. The more characters used, the smaller the font will be. Please refer to the sample shown for guidance - click thumbnail under product picture left. UK orders - allow 5-10 days for delivery, overseas orders - allow 8-12 days for delivery including any other items ordered.